German rabbi and author; born at Hotzenplotz, Austrian Silesia, Aug. 24, 1814; died at Beuthen Nov. 20, 1864. After attending various yeshibot in his native country, he became a pupil of Wolf Löw in Nagy Tapolcsany, and then, inclining to Ḥasidism, he went successively to Lemberg and Brody in order to continue his rabbinical education. Finally he went to Berlin, where he acquired some secular learning. Having obtained after great difficulties a license to marry, he settled as a business man in Bielitz, and in 1846 was appointed district rabbi of Wadowice, with a seat at Oswiecin (Auschwitz). In 1854 he was elected rabbi of Beuthen, which position he continued to hold until his death. Löwy was the author of "Biḳḳoret ha-Talmud: Kritisch-Talmudisches Lexikon" (vol. 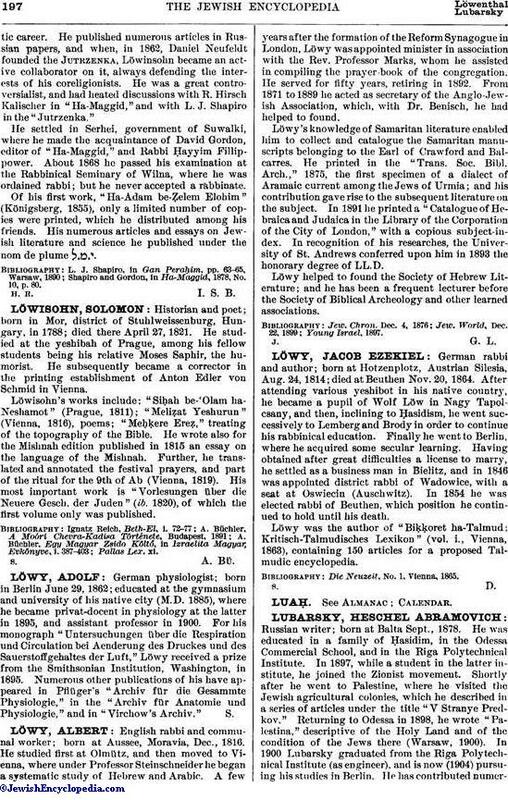 i., Vienna, 1863), containing 150 articles for a proposed Talmudic encyclopedia. Die Neuzeit, No. 1, Vienna, 1865.